The new translation of the Mass is six years old. Notwithstanding the introduction of some evocative language, its clunky sentence construction and often awkward vocabulary have tested us all. Three weeks ago Pope Francis sidelined the principles which guided that translation. He issued a motu proprio (personal edict) shifting the responsibility of liturgical translations from Rome back to national Conferences of Bishops. Thus he has reaffirmed the teaching of the second Vatican Council which states that it is local groupings of Bishops who oversee then approve translations into the language of the land. How had the place of translations shifted? Three main factors were at play. 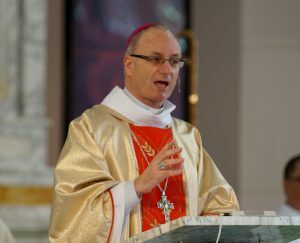 Firstly, the decision of Cardinal Medina Estevez (Prefect of the Congregation for Divine Worship and the Discipline of the Sacraments 1998-2002) to wrest control of translations by distancing ICEL (the International Commission on English in the Liturgy) ‒ which was a group of Bishops and language experts set up by a number of Bishops Conferences (New Zealand included)‒ to provide translations. Secondly, the publication by Medina’s Vatican department in 2001 of Liturgiam Authenticam, which outlined that translations were to be tightly shackled – word by word – to the ‘original’ Latin. And thirdly, the emergence of a group called Vox Clara whose role was to vet ICEL. These three linked events have now been quietly placed on the sidelines of history and influence. Vox Clara which paraded as the alternative to ICEL is now defunct, Liturgiam Authenicam has been popped by Pope Francis’ Motu Proprio Magnum Principium, and the current Prefect of the Congregation, Cardinal Sarah, has been politely sidestepped. Unlike what much of social media suggests, I don’t see this motu proprio as a “progressive versus conservative” tussle. Pope Benedict’s love for liturgy saw him underline the duty to preserve a sense of the transcendent and reverence. Pope Francis’s love for liturgy sees him underline that liturgy must be comprehensible and should be understood in the context of evangelization, which draws people in as participants, not observers, of the liturgy. Both are right. Liturgiam Authenticam in fact unfolded as a hindrance not a facilitation of Benedict’s intentions. The 2010 English translation of the Mass burdened rather than enhanced the beauty of the English language’s concise syntax, by imposing a Latin sentence structure. To claim that word for word translation and the use of obsolete and odd language (cf LA 27, 43) favours holiness and reverence is an ideological presumption not an ecclesiological reality. Such presumptions hinder the art of translation which is a delicate task of replicating meaning and concepts and even emotions (not words) from one language into another. A good translation is one whereby the reader assumes the text is the original. Why the Vox Clara group was seen to offer better advice to the Vatican than ICEL is hard to decipher. To the extent that it was responsible for the Liturgiam Authenticam, one struggles to understand how its members had a love of liturgy as a work of the People of God. It comes as no surprise then that some of the members of Vox Clara were the very same men who overturned the publication of the Catechism with inclusive language and instead insisted that references to men and women be reduced to the masculine alone. This is ideology, not koinonia or the communion of the Church, at work. And ICEL itself, enfeebled in the shadow of Vox Clara, has continued its work of translations but following the flawed guidelines of Liturgiam Authenticam has worn down the English-speaking world with revisions of various rites that few really want and even fewer actually asked for. Boh as the Italians say. Pope Francis’ motu proprio is also not simply about resetting areas of responsibility between local Bishops’ Conferences and Rome. Indeed, rightly the last card will still be played by Rome whose recognition of approved local translations remains a requirement. After all, the Holy See’s work is, by serving the Successor of Peter, to protect and foster the unity of the Church. The weight or responsibility has however shifted decisively to local Conferences. Ultimately then this motu proprio is an ecclesiological document: it is about how the Pope envisages the Church. Pope Francis is reminding us that what guarantees the universality of the Church is not petrified language or a static understanding of our living tradition. He is reminding us that the universality of the Church means that every culture is called to contribute to the understanding of our Catholic belief that Jesus Christ is the universal saviour of every generation and people. He is reminding us that the delicate art of liturgical translation is not ultimately responsible to dictionaries but to those who participate in, pray and live the liturgy. And most of all he is reminding us that the chief protagonist of liturgy is the Holy Spirit who draws every generation into new insights about the mysteries we believe. What happens next? It is too early to say. What I can say is what we all know: a better translation of the Mass is possible. I can also say that our New Zealand Bishops Conference more than any other in the English speaking world has laid before Rome and the Holy Father himself the frustrations experienced with the current translation, the causes of which Pope Francis has now addressed. Amen. And as the Italians say pazienza – patience!